State Sen. Martin Quezada calls for defense contractor MVM Inc. to stop using the vacant office at a news conference out front on July 9. PHOENIX – A vacant office building used to hold immigrant children in central Phoenix became a target of political opponents this week, with the Republican governor and two Democrats hoping to win a primary bid to run against him in November all calling for action in response to an investigation by Reveal. The announcement followed a news conference staged in front of the office building by state Sen. Steve Farley and other state politicians who called for the facility’s immediate shutdown. They also demanded an investigation of the holding place and urged officials to investigate the well-being of the children who had been held there. The building currently is not licensed by the state as a child care facility although MVM says it does not need a license. Farley is a candidate in the Democratic primary for governor this August. His campaign staff didn’t take long to react to Ducey’s response. 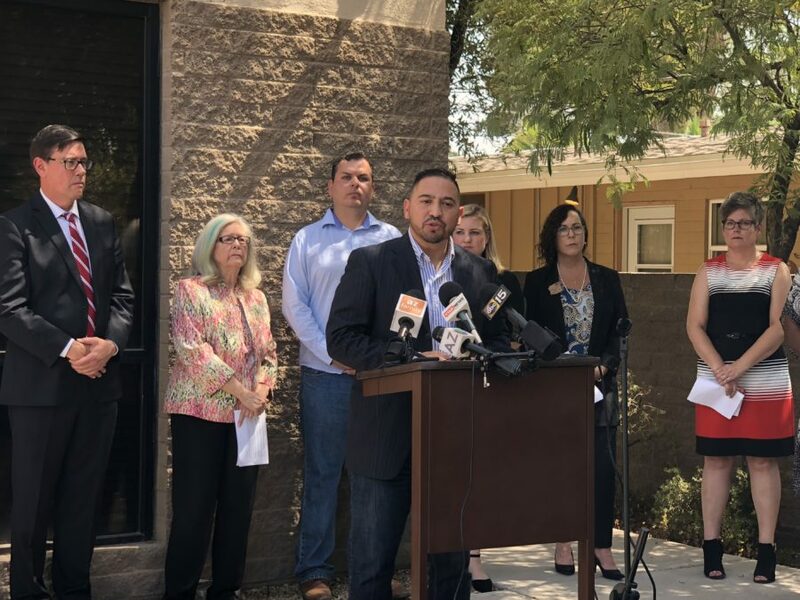 “It shouldn’t have to take a press conference to get the governor to investigate the well-being of children, but we’re glad he’s finally decided to do something,” said Kelsi Browning, a spokeswoman for Farley for Arizona. David Garcia, another Democrat who is ahead of Ducey in recent polls, issued a separate statement demanding an investigation into MVM’s treatment of children. “Trump’s immoral actions – which Ducey has enabled – demand that we rebuild our immigration system top-to-bottom and start by replacing ICE with an immigration system that reflects our American values, values I and so many before have served to protect,” he said. Separately, Rep. Ruben Gallego, D-Arizona, wrote to the U.S. Department of Homeland Security, asking for an investigation, and to the head of MVM, asking for additional information about how long children were held there, under what conditions and whether the people responsible for them were qualified. “The decision to use an ill-equipped office building for this purpose calls into question MVM’s ability to competently care for migrant children,” Gallego wrote. Reveal learned of the issue from concerned neighbors who initially were worried the children were being trafficked. During three weeks in June, neighbors saw dozens of children brought into the building, but no children leave. One neighbor shared videos with Reveal showing children being ushered into the building, one too young to walk. The 3,200-square-foot building, leased by MVM, had no kitchen, a few toilets, no showers and no yard. The company maintains that the building does not qualify as shelter or housing because children were only temporarily held there before they were transported to the airport. Reveal asked Arabit on Monday to provide details, including the names of state officials who gave approval, but he has not yet responded. Any determination about whether the facility should be licensed to hold children, even temporarily, would be up to the state health department. Cynthia Weiss, a spokeswoman for the state Department of Child Safety, said the agency cannot disclose whether it received complaints about the facility tied to child neglect. Councilwoman Kate Gallego said she has ordered inspections of the MVM-leased office building from the fire, fire code and planning departments. Phoenix police inspected the location during the weekend and found no children present, she said. “We won’t stand for unsafe facilities in our city,” said Gallego, who is running for mayor of Phoenix this November. Gallego noted that the Phoenix Police Department received a report on May 27 to investigate the case of a 17-year-old boy from Honduras who fled while being transferred to the office building. He’s still missing. “That goes to show this is a poorly thought-out plan. They did not have the necessary tools to keep these children safe, children who should not have been separated from their parents to begin with,” she said. Phoenix police received a complaint from a neighbor on June 22 to check on the children’s welfare. Police told Reveal they didn’t investigate further after they found out the facility was being operated by a contractor for U.S. Immigration and Customs Enforcement. Sgt. Vincent Lewis, a public information officer with the department, said in an email that police do not perform licensing inspections. Human rights activists in Arizona said they want more action by state officials about the general treatment of detained immigrants. Beyond the calls for investigation, some people whose lives have been directly impacted by the nation’s immigration policies remain skeptical about politicians sincerely dealing with immigration issues. Farley, for instance, was joined in the press conference by state lawmakers including Sen. Martin Quezada, Senate Minority Leader Katie Hobbs, Rep. Lela Alston, Rep. Gerae Peten and Sen. Lisa Otondo. “It’s really upsetting. They all want to be in the picture, they come out to advance politically, but it’s really useless,” said Juan Miguel Cornejo, a Mexican immigrant currently seeking asylum, who spent nine months at the troubled Eloy Detention Center in Arizona. Cornejo added that he was equally disappointed with the Obama administration’s inaction on reports of abuses and deaths in immigrant detention. It is not clear at this point whether the children held in the Phoenix building were among the estimated 3,000 separated from their parents in June. The young age of several seen entering the building and the timing of their appearance there indicates they could be among that group. Regardless, mental health experts and advocates say that ICE is adding salt to a wound for a population, many of whom have already experienced trauma in Central America. Blanca Bertrand, an associate family therapist who specializes in trauma and works with immigrant families, said children’s brains go into a state of fight or flight when they experience danger, which can damage their brain and development. Walking into a substandard facility “triggers complete terror, nothing looks safe for them,” she said.